From a well-to-do Scottish Family, which ran a successful trucking business, Coulthard was surrounded by racing from an early age. He was karting from the age of eight and was a multiple Scottish champion before he moved into Formula Ford racing at the end of 1988. He dominated both junior championships in 1989 and finished third in the Formula Ford Festival and he was quickly snapped up to race for Paul Stewart Racing in Formula Vauxhall Lotus and in the GM Lotus Euroseries. He was looking like a potential champion in 1990 when he crashed at Spa and broke his leg. But he ended the year testing for the McLaren team as part of his prize for being named the first McLaren Autosport Young Driver of the Year in 1989. He moved into Formula 3 in 1991 with PSR and fought a season-long battle for the title with Rubens Barrichello, the Brazilian eventually coming out ahead but Coulthard won the Marlboro Masters and Macau GPs to underline his potential. He moved to Formula 3000 in 1992 with PSR but the team was not very competitive and Coulthard finished only ninth in the series. At the end of the year however he had another F1 test with the Camel Benetton Ford team. In 1993 he switched from PSR to Pacific Racing. It proved to be a good step and he won the race at Enna and a string of good showings saw him end the year third in the championship. That year he began testing for the Williams-Renault team and also raced a Jaguar in the Le Mans 24 Hours, winning the GT class on the road. Named as the official Williams test driver in 1994 Coulthard stepped into the limelight after Ayrton Senna was killed. Only an ignition problem stopped Coulthard from finishing third in his first Grand Prix at Barcelona. Williams decided to alternate Coulthard with former World Champion Nigel Mansell. Coulthard responded by signing a deal with McLaren. Williams decided that it preferred to have Coulthard rather than Mansell and so David became a fulltime Williams driver in 1995. It was a year of learning with some mistakes but also some impressive performanes, culminating in his first victory at the Portuguese GP. At the end of the year he left Williams to join Mika Hakkinen at McLaren. The two men were very evenly matched in 1996 but neither won a race while in 1997 Coulthard did better in the World Championship, winning in Australia and at the Italian GP to score 36 points to Hakkinen's 27. But in 1998 Hakkinen was the man to beat and although Coulthard won the San Marino GP it was his only victory of the year. Hakkinen won the World Championship. It was a similar story in 1999 with David winning the British and Belgian GPs but being beaten to fourth place in the World Championship. In 2000 Coulthard won the British GP and a week later was fortunate to emerge unscathed from a plane crash at Lyon-Satolas airport. It seemed to give him a boost and he won again at Monaco and in 2001 it was Coulthard rather than Hakkinen who led the McLaren attack against Michael Schumacher. 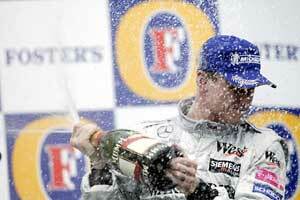 Coulthard was again the lead driver for McLaren in 2002 although his new team mate Kimi Raikkonen pushed him hard. Coulthard's victory at Monaco was, however, assured and brilliant although in 2003 he was overshadowed by the Finn and McLaren announced that in 2005 it would be running Juan Pablo Montoya. Coulthard moved to Red Bull Racing but he had a disappointing season in 2006. 2007 was no major improvement, starting with Coulthard colliding with Alexander Wurz of Williams in Australia, though he put on an impressive performance at the European Grand Prix where he finished fifth after starting 20th on the grid.